260 pages | 14 B/W Illus. What is meant by pedagogy? How does our conception of pedagogy inform good teaching and learning? Pedagogy is a complex concept of which student and practising teachers need to have an understanding, yet there remain many ambiguities about what the term means, and how it informs learning in the classroom. Understanding Pedagogy examines pedagogy in a holistic way, supporting a more critical and reflective understanding of teaching and learning. It considers pedagogy as a concept that covers not just teaching approaches and pupil-teacher relationships but one which also embraces and informs educational theory, personal learning styles, assessment, and relationships inside and outside the classroom. A detailed consideration of what it means to be a professional in the contemporary climate, Understanding Pedagogy　challenges student and practising teachers to reappraise their understanding and practice through effectively linking theory and practice. Key issues explored include the importance of understanding a learning styles profile, the application of cognitive neuroscience to teaching, personalised learning, assessment and feedback, and what we mean by critical reflection. Using the Personal Learning Styles Pedagogy, the authors make explicit the integration of theory and practice and the many decisions and selections that teachers make, their implications for what is being taught and learnt, how learners are positioned in the pedagogical process, and ultimately, how learning can be improved. 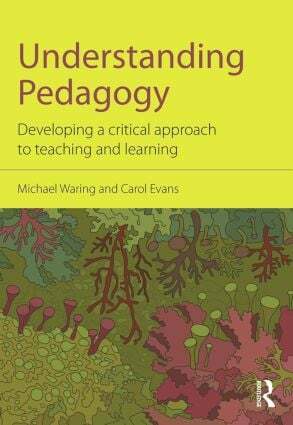 Understanding Pedagogy will be essential reading for student and practising teachers, as well those on Education Studies courses and undertaking masters level courses, involved in the endeavour of understanding what constitutes effective teaching and learning. Michael Waring is the Director of the PGCE / MSc (QTS) PE programmes and Senior Lecturer in the School of Sport, Exercise and Health Sciences at Loughborough University, UK. Carol Evans is Professor of Higher Education at the University of Southampton, UK; a National Teaching Fellow and Principal Fellow of the Higher Education Academy, UK; President of the Education, Learning, Styles, Individual differences Network (ELSIN), and Associate Editor of the British Journal of Educational Psychology. She is also a Visiting Fellow at the Institute of Education, University of London.